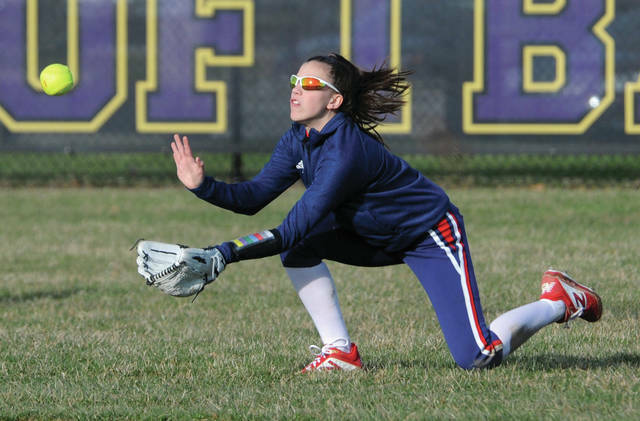 Piqua rightfielder Chaia Sowers makes a diving attempt at a fly ball Monday against Vandalia-Butler. Piqua second baseman Kathy Young throws out a Vandalia-Butler baserunner from her knees Monday. Piqua third baseman Hannah Anderson puts the tag on Vandalia-Butler base runner Sydney Theobald Monday. Piqua pitcher Mariah Blankenship fires a strike Monday. Editor’s Note: This story will appear in Wednesday’s Miami Valley Today. 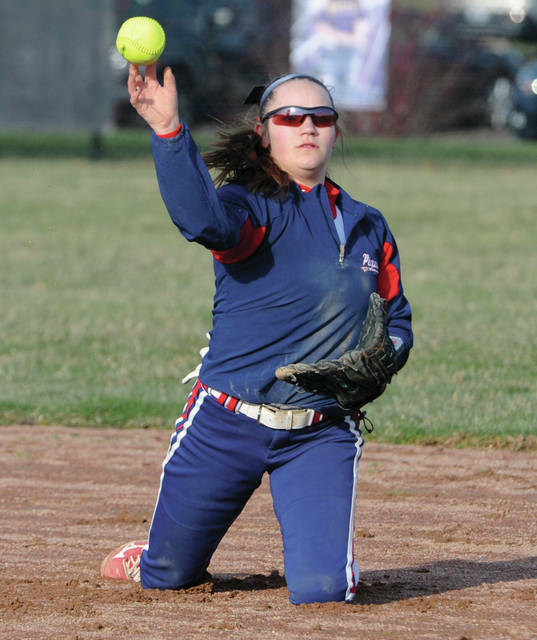 VANDALIA —- The Piqua softball team took a 6-3 lead to the home fifth inning at Butler in its GWOC American opener Monday. But, the Aviators plated six runs in the fifth and held on for a 9-7 victory. Butler improved to 4-1 overall and Piqua dropped to 2-2, with the two teams playing at Piqua on Tuesday to complete the season series. 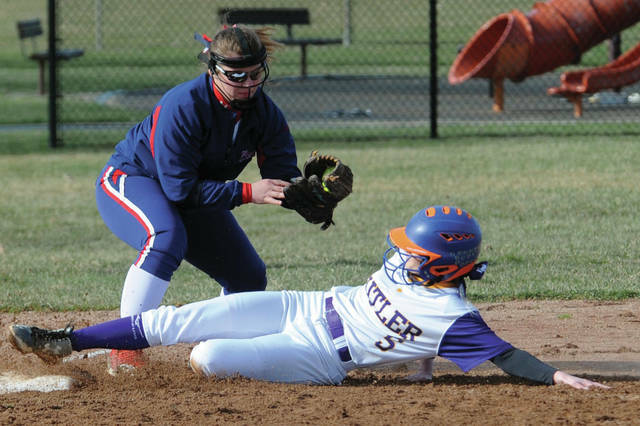 Butler had just three hits in the inning, but Piqua failed to make the plays on several balls and helped Butler with three walks and a hit batter. Two of the Aviator runs scored on wild pitches. Megan Allen and pitcher Sydney Theobald both had RBI doubles in the inning, while Riley Truesdale had a RBI single on a blooper that fell in short leftfield. Piqua got one run back in the sixth to make it 9-7. 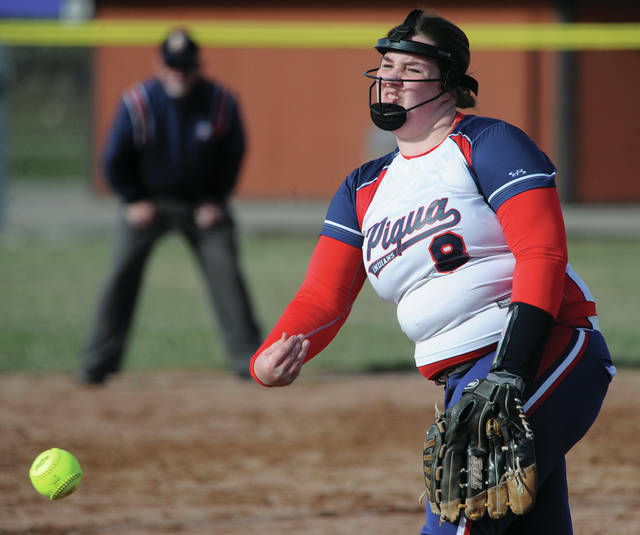 Chaia Sowers, Hannah Anderson and Mariah Blankenship singled to make it 9-7, but Piqua left the tying runs on second and third and could not score in the seventh as Butler picked up the win. Butler had taken a 1-0 lead in the first when Theobald was hit by a pitch, moved to third on Amber White’s single and scored Allen’s RBI single. Piqua broke through with four runs in the third with four runs. After a walk to Kylie Trissell, Sowers had a bunt single. One run scored when Hannah Anderson reached on an error, Blankenship had a two-run single and Kenzi Anderson’s fielder’s choice scored the final run of the inning. But, Butler cut the deficit to 4-3 in the home third. Two walks and a single by Allen loaded the bases. Nikita Brown had a RBI single and Truesdale’s fielder’s choice scored the second run. In the fourth, Piqua loaded the bases with no outs and had the top of the order up. But, Hannah Anderson’s sacrifice fly was the only run Piqua would get, making it 5-3. Kamy Trissell had singled, Kylie Trissell was hit by a pitch and Sowers, who was 3-for-3, had another single to load the bases before Anderson’s deep fly brought a run in. Piqua made it 6-3 in the top of the fifth. Kenzi Anderson had an infield single with one out and Kathy Young walked. Kamy Trissell’s sacrifice fly scored Kenzi Anderson to make it 6-3, but the Indians couldn’t overcome the Aviators big fifth inning. Blankenship pitched a nine-hitter, striking out two, walking seven and hitting two batters. Sowers turned a double play from rightfield to end the second inning. After the ball popped out of her glove, she grabbed it with her barehand and threw to Paige Hinkle at first to complete the double play. Theobald pitched a nine-hitter, striking out five, walking two and hitting a batter.